Think you can handle some speed? Here’s your chance with Hangar 9’s Sundowner™ 50 ARF. Based on the Sundowner Formula 1 80-inch giant-scale racer, this speedy sport performer has a scaled-down aggressive racer body design that always makes it look like it’s tearing through the sky. Because of its smooth flight characteristics and precise, sport handling, even intermediate pilots will feel comfortable behind the sticks. Unlike other racers that may be difficult to fly, the Sundowner 50’s streamlined design makes this racer smooth, precise and ready-to-roll. 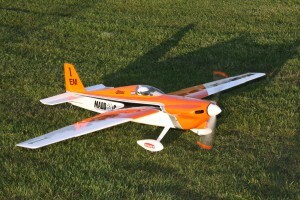 It may look like a racer thanks to its body design, but it is an aerobatic sport model geared for performance. The .50-size Sundowner can be powered for performance using a variety of 2- or 4-stroke glow engines or converted to electric power for clean, no-fuss flying. The two-piece plug-in wing makes transporting this aircraft an easier process. A removable top hatch provides access to the plane’s interior to make it easy to get to the electronics and/or fuel tank. The Sundowner also includes installed high-quality prehinged hardware and a heavy-duty anodized aluminum wing tube which provides extreme durability at low weight.